Sunshine and blue skies and springtime bouquets,-- Light hearts and laughter and bright, happy days... Dogwoods are blooming young hatchlings appear May is such a lovely time of the year. October Autumn leaves of red and gold that crunch beneath your feet, Pumpkins on front porches, candy corn, and trick-or-treat, Tart and tangy cider, apples ripened on the trees, A hint of winter coming on the chilly autumn breeze. March Racing clouds and whistling winds, Coats flapping in the breeze, Bright kites circling in the skies, The dance of swaying trees, The cheerful sight of crocuses, The first sweet breath of spring - Just part of all the many moods The month of March can bring. November Orange pumpkins full and round... Cornstalks gathered on the ground... Blue skies clear and autumn-bright... Harvest moons and frost at night... Leaves raked high in great big piles... November sights bring thankful smiles. August Lazy summer afternoons, Walks along the beach, Balmy evenings, cloudless skies, Stars just out of reach, Sailing on a quiet lake, Hammocks in the shade... These are the simple treasures Of which August days are made. February Winter walks and starlit nights, Good books and cozy hours, Time for friends, and heartfelt sharing, Dreams of springtime flowers... Although it may be short on days, Each February brings The simple little gifts we count Among life's precious things. Friends are the Family you choose with your heart. January Sparkling winter sunshine, Faces all aglow Making resolutions, And angels in the snow - Steaming cups of cocoa, A year that's fresh and new... All of this is magic - Unfolding just for you. Good Morning, Sunshine! Have a happy day! You brighten the day in so many ways. Thanks a Lot! It's the Winter Solstice-- Shorter days, longer nights and lots of celebrations! Leaf by leaf, the spring arrives, Bloom by bloom the world grows bright As day by day, love fills the world With simple joys and heart's delight. Barbecues and picnics, Swimmers soaking up the rays, Bike rides in the country, Shady spots on sunny days Summertime vacations, Lemonade on front-porch swings Special thoughts and memories of July's most favorite things. "Always believe that something wonderful is about to happen." Hope you have a happy day! A season that is sunshine bright... A happy heart that's warm and light... Golden days and dreams come true... That's what is being wished for you! 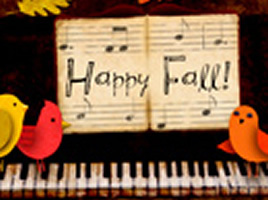 Happy Fall! Just Buzzing By To Brighten Your Day!